Before 1775: he started his career at an early age with his brother as disciples of the actor Ikushima Jûshirô, who gave them the names of Ikushima Kinzô and Ikushima Ginzô . 1775 ~ 1777: Kinzô worked as a zamoto for two seasons at the Kadomaruza, a hama shibai venue. 19th day of the 11th lunar month of 1777 : Nakamura Noshio I died in Edo. Fall 1779: he was adopted by Nakamura Tomijûrô I. 11th lunar month of 1779: Ikushima Kinzô took the name of Nakamura Noshio II at the Kado no Shibai; he performed as a wakaonnagata the role of Princess Suminoe in the kaomise drama "Senshû Banzei Chibako no Tamamono", which was produced by Yoshizawa Iroha I. 7th lunar month of 1780: Noshio played in the same theater the role of Kyô-no-Kimi in the drama "Yoshitsune Senbon Zakura". 1st lunar month of 1782: the play "Tengajaya-mura" was staged for the first time in Kyôto, at the Kitagawa no Shibai; Noshio played the role of Hayase Genjirô [casting]. 1st lunar month of 1784: Noshio's rank in the Kyôto hyôbanki, wakaonnagata section, was jô-jô-(shiro)hankichi (superior - superior - (white) half excellent). 11th lunar month of 1784: Noshio took part in the Kado no Shibai kaomise, playing the roles of Haru and Tatsuta-no-Mae in the drama "Sugawara Denju Tenarai Kagami", which was produced by Onoe Ushinosuke I. 11th lunar month of 1785: Noshio became zamoto in Ôsaka. 3rd day of the 8th lunar month of 1786 : his adoptive father Nakamura Tomijûrô I died. 2nd lunar month of 1787: Noshio played at the Ônishi no Shibai the roles of Kyô-no-Kimi and Osato in the drama "Yoshitsune Senbon Zakura". 4th lunar month of 1787: Noshio played in the same theater the role of Konami in the drama "Kanadehon Chûshingura". 10th lunar month of 1787: Noshio played at the Kitagawa no Shibai the role of Suke-no-Tsubone in the drama "Yoshitsune Senbon Zakura". 4th lunar month of 1788: Noshio played at the Kado no Shibai the roles of Katsuyori and Minosaku in the drama "Honchô Nijûshikô". He also played the leading role of the shirabyôshi in the dance "Musume Dôjôji". 1st lunar month of 1789: Noshio's rank in the Ôsaka hyôbanki, wakaonnagata section, was jô-jô-(shiro)kichi (superior - superior - (white) excellent). 9th lunar month of 1791: premiere of Nagawa Shimesuke I's chûshinguramono "Iroha Gana Shijûshichi Moji" in Ôsaka at the Kado no Shibai; Noshio played the roles of Konami and Osai [more details]. 8th lunar month of 1792: Noshio played at the Kado no Shibai the roles of Shizuka Gozen and Osato in the drama "Yoshitsune Senbon Zakura". 1st lunar month ~ 3rd lunar month of 1794: premiere of Tatsuoka Mansaku's drama "Keisei Haru no Tori", which was famous for its "Umagiri" scene and was produced by the zamoto Asao Okujirô I in Ôsaka at the Kado no Shibai; Noshio played the roles of the Korean Imperial Princess Shôgiku, the keisei Sonogiku and Mairase Soroku's nyôbô Oyuki [more details]. 9th lunar month of 1794: first Kabuki adaptation of Chikamatsu Hanji's puppet theater drama "Kamakura Sandaiki"; Noshio played the role of Princess Toki [casting]. Fall 1794: Kataoka Nizaemon VII, the playwright Namiki Gohei I and Noshio went together to Edo. 11th lunar month of 1794: Noshio performed at the Miyakoza in the kaomise "Uruô Tosshi Meika no Homare". 1st lunar month of 1795: Namiki Gohei I's drama "Godairiki Koi no Fûjime" was staged for the first time in Edo, at the Miyakoza; Noshio played the role of Masuya Okono [casting]. 4th lunar month of 1795: Noshio played in the same theater the roles of Tonase and Okaru in the drama "Kanadehon Chûshingura". 9th lunar month of 1795: Noshio played in the same theater the roles of Sakaki-no-Mae, Kuzu-no-Ha and the fox Kuzu-no-Ha in the drama "Ashiya Dôman Ôuchi Kagami"; the role of Abe no Yasuna was played by Sawamura Sôjûrô III. 11th lunar month of 1795: Noshio performed at the Miyakoza in the kaomise drama "Kaeribana Yuki no Yoshitsune". 2nd lunar month of 1796: Noshio played in the same theater the leading role of the dance "Musume Dôjôji"; his performance was extremely successful and became a long run (100 days up to the 5th lunar month). 4th lunar month of 1796: Noshio played in the same theater the role of Princess Yuki in the drama "Gion Sairei Shinkôki"; the roles of Matsunaga Daizen and Konoshita Tôkichi were played by Kataoka Nizaemon VII and Ichikawa Yaozô III. 7th lunar month of 1796: Noshio played in the same theater the roles of Sakuramaru and Chiyo in the drama "Sugawara Denju Tenarai Kagami"; the roles of Matsuômaru and Umeômaru were played by Nakamura Nakazô I and Ichikawa Yaozô III. 9th lunar month of 1796: the play "Hikosan Gongen Chikai no Sukedachi" was staged for the first time in Edo, simultaneously at the Kiriza and the Miyakoza; Noshio played the role of Ichimisai's elder daughter Osono in the latter theater [casting]. 11th lunar month of 1796: Noshio performed at the Miyakoza in the kaomise drama "Seiwa Nidai Ôyose Genji". 3rd lunar month of 1797: Noshio played in the same theater the leading role of the dance "Hanabusa Shûjaku no Shishi". 5th lunar month of 1797: Noshio played in the same theater the roles of Oyoshi and Chidori in the drama "Hirakana Seisuiki". 6th lunar month of 1797: Noshio played in the same theater the role of Hanazono in the drama "Ôtô-no-Miya Asahi no Yoroi"; he also played the role of Shizuka Gozen in the 4th act of the drama "Yoshitsune Senbon Zakura". 8th lunar month of 1797: Noshio played in the same theater the roles of Uji-no-Kata and Kagaribi in the drama "Ômi Genji Senjin Yakata". Fall 1797: the Nakamuraza was back in business, receiving the license used by the Miyakoza. 11th lunar month of 1797: Noshio performed at the Nakamuraza in the kaomise drama "Kaikei Kokyô no Nishikigi". 1st lunar month of 1798: Noshio's rank in the Edo hyôbanki, wakaonnagata section, was jô-jô-kichi (superior - superior - excellent). 4th lunar month of 1798: Noshio played in the same theater the roles of Omiwa and Sadaka in the drama "Imoseyama Onna Teikin". 9th lunar month of 1798: Noshio played in the same theater the roles Kuzu-no-Ha and the fox Kuzu-no-Ha in the drama "Ashiya Dôman Ôuchi Kagami"; the role of Abe no Yasuna was played by Bandô Minosuke I. 11th lunar month of 1798: Noshio moved to the Moritaza and performed in the kaomise drama "Taiheiki Mitsugi no Funauta", which celebrated the shûmei of Ichikawa Aragorô I. 1st lunar month of 1799: Noshio played in the same theater the role of Osono in the drama "Hikosan Gongen Chikai no Sukedachi"; the role of Rokusuke was played by Ichikawa Danzô IV. 5th lunar month of 1799: Noshio played in the same theater the leading role of the dance "Musume Dôjôji". 5th lunar month of 1799: Noshio played in the same theater the role of Chiyo in the drama "Sugawara Denju Tenarai Kagami". Fall 1799: Noshio went back to Ôsaka after 5 seasons spent in Edo. 11th lunar month of 1799: Noshio played at the Kado no Shibai the role of Kyô-no-Kimi in the kaomise drama "Yunzei Tôri Yaguruma", which was produced by Fujikawa Katsujirô. He also played the role of Kuzu-no-Ha in the drama "Ashiya Dôman Ôuchi Kagami"; his stage partners are Asao Tamejûrô I, Arashi Kichisaburô II, Nakayama Ittoku I and Seki Sanjûrô I. 12th lunar month of 1799: the troupe moved from the Kado no Shibai to the Kitagawa no Shibai in Kyôto to perform in a similar program. 1st lunar month of 1800: Noshio appeared on stage for the last time, in Ôsaka at the Kado no Shibai, performing in the new year drama "Keisei Hana no Yamazaki". He suddenly falls ill and has to retire. 20th day of the 3rd lunar month of 1800 : Noshio died in Ôsaka . Nakamura Noshio II was a talented and popular wakaonnagata actor, who made most of his career in Kamigata but ended it with an extremely successful 5-year stay in Edo, where he was called Edo kusshi no wakaonnagata in 1798 ("the leading wakaonnagata in Edo"). He excelled in budôgoto and keisei roles. He unfortunately died too young, at the very beginning of his 40s; if he had lived longer, he most likely would have taken the name of Nakamura Tomijûrô II. 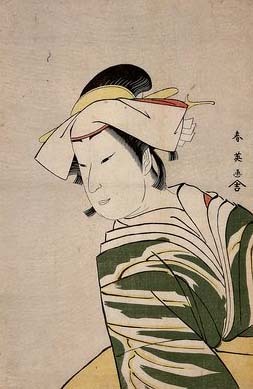 Was Ikushima Jûshirô the master of Ikushima Kinzô? Ikushima Kinzô was born in 1759. If we assume that Ikushima Jûshirô was 10 years old when he went to Edo in 1698 and that Ikushima Kinzô was 10 years old when he started to be the disciple of Ikushima Jûshirô, it would mean that the master was more than 80 years old at the start of the apprenticeship. Not impossible indeed but we do not exclude the hypothesis that there was another actor who held the name of Ikushima Jûshirô and was the master of Ikushima Kinzô. The 19th day of the 11th lunar month of the 6th year of the An'ei era was the 18th of December 1777 in the western calendar. The 3rd day of the 8th lunar month of the 6th year of the Tenmei era was the 26th of August 1786 in the western calendar. His tombstone was located in the cemetery of the Yakuôji temple in Ôsaka.